The International Reciprocal Trade Association (IRTA) consists of member exchanges and firms that are among the most successful and reputable in the industry. They represent active, ethical barter exchanges in all parts of the world. The IRTA Code of Ethics is the cornerstone on which the association was built and upon which membership is determined and maintained. IRTA originally defined the Code of Ethics 32 years ago when a small group of reputable barter exchanges came together to demand a level of conduct that each member would be expected to meet. Since then, IRTA has strived to represent only those exchanges that successfully do so. THE IRTA CODE OF ETHICS WAS RE-WRITTEN IN SEPTEMBER OF 2011 AND APPROVED BY THE IRTA GLOBAL BOARD ON SEPTEMBER 19, 2011 AND THE IRTA MEMBERSHIP ON SEPTEMBER 20, 2011 AT THE 32ND ANNUAL IRTA CONVENTION IN RIVIERA MAYA, MEXICO. THE NEW IRTA CODE OF ETHICS AND CONDUCT ADDRESSES SPECIFIC PRACTICAL ISSUES FACING THE MODERN BARTER INDUSTRY AND PROVIDES A SERIES OF MEANINGFUL GUIDLINES FOR IRTA MEMBER BARTER EXCHANGES TO FOLLOW. THE NEW CODE ALSO PROVIDES A CLEAR TIERED DISCIPLINARY PROCESS FOR COMPANIES FOUND IN VIOLATION OF THE ETHICS AND CONDUCT CODE. 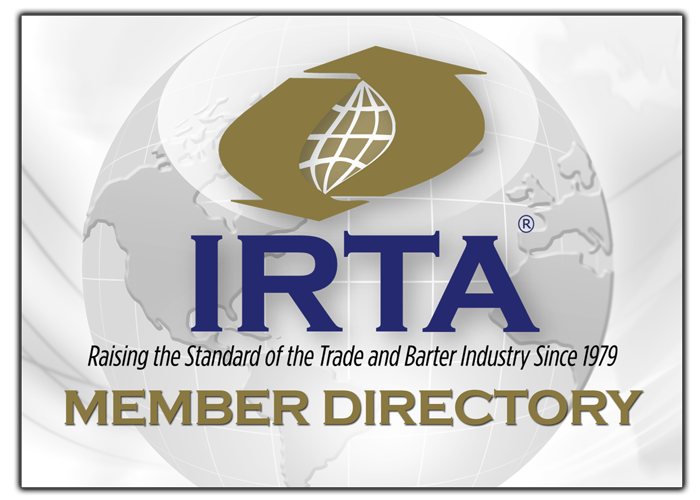 In order to be considered for membership, exchanges and firms have agreed to abide by the Code of Ethics that establishes a general level of conduct and ensures all who participate in barter, exchange and indeed other forms of cashless trading are treated fairly and honestly by IRTA members. In an effort to keep pace with the latest advancements in non-profit corporate governance, the IRTA Global Board of Directors approved and adopted new modernized bylaws for IRTA on September 24th, 2016. The new IRTA bylaws are the result of a five month bylaw review process by the IRTA Global Board, which included the professional guidance and input from IRTA’s legal counsel, Carl Steinbrenner, Esq. To review IRTA’s new Bylaws, as well as two new Committee Charters, click button(s) below. A members’ conduct in the marketplace is integral to sustaining membership in IRTA. For that reason, each member not only agrees to abide by the IRTA Code of Ethics, but also agrees to participate in a peer review process should their conduct be called into question. The Peer Review process is initiated by a formal complaint filing made with IRTA. IRTA members recognize that membership in IRTA carries with it the responsibility of conducting themselves and their barter exchanges, corporate exchanges, internet exchanges and/or community currency organizations in a manner that is consistent with the IRTA goal of providing the most professional, ethical and well managed organized barter programs to the public. Therefore, the members of IRTA agree to abide by the following specific codes of conduct and barter management. In the event a violation occurs with any section of this Code of Ethics, the party determined to be in violation will be subject to the disciplinary provisions as described in Article XII herein. a) IRTA members shall operate their businesses within the bounds of the law and comply with all laws, regulations rules and ordinances for the jurisdiction they reside. b) IRTA members shall establish internal rules, procedures and practices in their business operations that will serve the best interest of the public and their clients. a) U.S. Member exchanges will abide by the IRS reporting requirements as defined in the Tax Equity & Fiscal Responsibility Act of 1982. 1099B forms must be distributed to all exchange members that had sales for the exchange’s fiscal year and exchanges must report their annual sales to the IRS annually. b) U.S. member exchanges agree to communicate the reporting requirements of TEFRA to all exchange member prospects. Additionally, IRTA members are encouraged to highlight TEFRA reporting requirements in their marketing and sales materials, including their websites. c) Non-U.S. exchanges must adhere to the governmental reporting requirements of their given jurisdictions. a) The number of active members in their exchange. Active members are defined as those members who have made a purchase or sale within the last twelve (12) months. b) The limited scope of products and services available. c) The accurate trade volume of their exchange. ￼d) Accurately communicating any and all restrictions related to an offering to its exchange members. a) Exchanges are not permitted to gift unearned trade dollars to new members who sign-up with their barter exchange. b) Exchanges are not permitted to match clients’ positive trade balances from another barter exchange, (this does not apply to corporate AR credits). Nor are exchanges permitted to pay-off a client’s credit line from another exchange or convert any portion of another exchange’s members’ balances into their own exchange. c) Exchanges are not permitted to offer client’s of another exchange a free membership or reduced fees in their exchange in an effort to induce clients into their exchange, unless such free membership or reduced fee policies are the customary practice of the exchange. Members shall not discriminate on the basis of race, color, national origin, religion or gender in hiring employees, acceptance of clients or establishment of any other business relationship. No person or company shall engage in the unauthorized use of the trademark, trade name, corporate name or slogan of another business. Nor shall any person or company purchase the domain names or materially similar domain names of other companies so as to restrict the rightful owner their inherent ownership benefits. a) When IRTA members expand their core operations through the creation of franchisees, licensees or territories, IRTA members agree to comply with all Federal, State, local or jurisdictional requirements related to the creation of such business entities and agree to supply IRTA with documentation verifying compliance with such regulatory laws. b) When IRTA members establish territory’s, licensee or franchisee offices of the parent company, the licensor or franchisor shall be liable for the trade debts of the territory, licensee or franchisee office in the event of termination of the territory, licensee or franchise office. Should the territory, licensee or franchisee be a separate legal entity and declare bankruptcy, the IRTA member parent company shall be liable for the trade debts of the territory, licensee or franchisee regardless of whether the territory’s, licensee’s or franchisee’s corporate entity was legally discharged in bankruptcy court. a) When IRTA members are involved in the purchase of another exchange every effort will be made to protect and honor the negative and positive balances of all the accounts, including reciprocal accounts, of the acquired exchange in an equitable manner. a) IRTA exchanges are not permitted to knowingly contact or solicit for membership the members of another IRTA member exchange. This prohibition against poaching another exchange’s members is absolute and applies to, but is not limited to direct personal solicitation, telephone, fax, e-mail and internet solicitation. proof is on the complainant to show beyond any reasonable doubt that the alleged improper poaching activity took place. Such burden of proof is a high threshold. When evaluating all IRTA Ethics Complaints, the IRTA Ethics Committee reserves the right to interview IRTA member employees, independent contractors and sales prospects. IRTA also reserves the right to inspect any and all documentation related to any claim brought by an IRTA Ethics Complaint, be it on paper, e-mail, social media or other internet forum. IRTA members agree in good faith to provide all information requested by the IRTA Ethics Committee. Such information shall be held confidential by the Ethics Committee. Withholding of any material information by either the complainant or respondent shall be grounds for a decision in favor of the non-withholding party, and shall be made at the sole discretion of the IRTA Ethics Committee. The alleged occurrence which is the subject of the Ethics Complaint must have occurred within two years on the filing date of the Ethics Complaint. First Offense: A letter of reprimand will be sent to the violating party and notice of such action shall be posted on the IRTA website for a period of 30 days. Second Offense: The violating party’s IRTA membership shall be suspended for a period of 180 days and notice of such suspension shall be posted on the IRTA website. The violating party also will not be permitted to attend IRTA Conventions or participate on the IRTA Global Board or IRTA Committees during their suspension. Third Offense: The violating party’s IRTA membership will be automatically terminated. The principals, officers and/or managing director of such entity shall not be permitted to re-apply for membership in IRTA with a different entity for a period of 5 (five) years. The Global Boards of Directors of IRTA shall review this Code of Ethics from time to time and any revisions or amendments shall be ratified by two-thirds majority vote of the members.